Comes with two round Mini dorm trunks! Having a small college dorm room requires you to get creative with your dorm room storage. Small dorm items can be some of the hardest dorm essentials to store. You can't really set them up on your dorm desk or dorm dresser without taking up a lot of space that only results in these small dorm items getting knocked over and damaged or broken later. You don't have to leave these dorm necessities at home. Simply add dorm storage solutions like our Dark Lavender Texture Rounded Style Mini-Trunks. 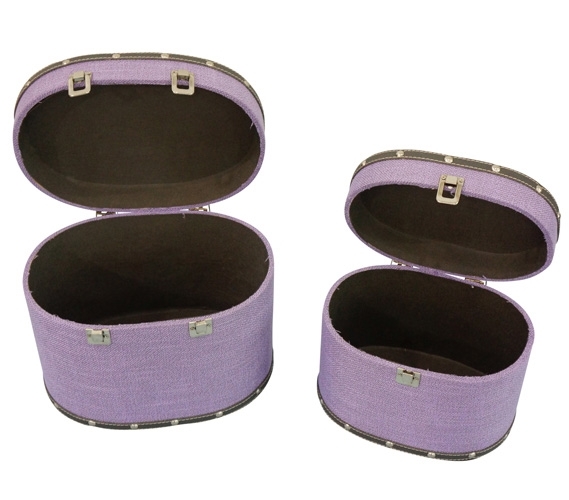 Our Dark Lavender Texture Rounded Style Mini-Trunks come in a set of two so you can maximize your dorm room storage. While these college supplies add extra dorm room storage to your college dorm room, they are also compact so you don't lose a lot of space on your dorm dresser or dorm desk. 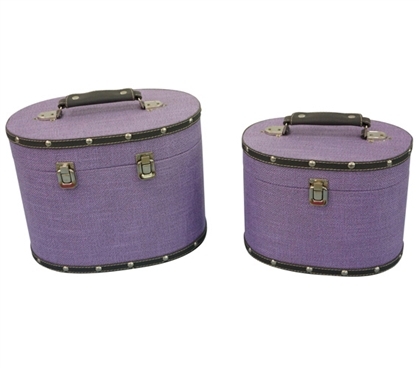 Each dorm trunk has a dark lavender color with riveted details on the top and bottom so while you're keeping your small dorm items organized, you're also adding to your dorm room decor. With the compact size of these dorm storage solutions, not only are you taking up little dorm room space, you're also getting the benefit of portability so you can take these dorm supplies on vacation with you or to a weekend trip home to visit your family. Small: 10.2" x 7.08" x 7.4"
Large: 12" x 8.66" x 9"